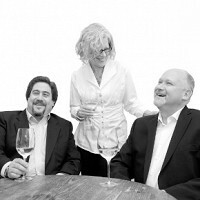 When wine enthusiasts and long time friends Guy Beck and Nick Thompson began making their own wine, they never imagined it would inspire them to invent a device that could remove carbonic acid and improve the flavor, feel, and finish of any bottle of wine in a matter of seconds. Designed and assembled in the United States, VinoVinti is a patented tool that uses a specially-engineered ceramic rod and vacuum pump to create nucleation—a process that releases excess carbon dioxide molecules from your wine to minimize acidity. 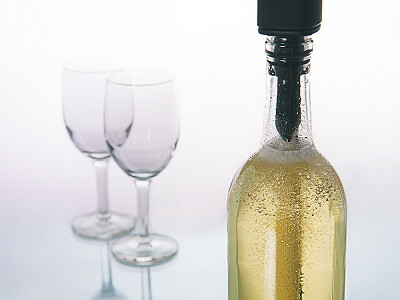 Made of durable, food safe materials, VinoVinti helps make wine taste better faster than decanting and more effectively than other aeration devices. Simply pump, pour, and taste the difference a carbonic acid extractor can make. Hello, I am Valerie and I would be delighted to answer any questions you have about VinoVinti. 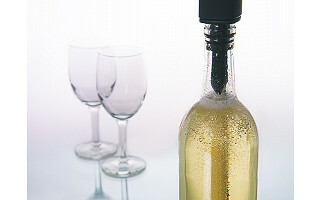 It is really great fun sharing how our new, innovative wine accessory makes wine taste better. We are thrilled to a part of The Grommet’s creative and friendly marketplace. Hi Valerie, I'd like to know how long the VinoVinti will last after purchasing? @Guest VinoVinti will last a lifetime with proper care. What is the proper care? How do you clean it? Can one Vino Vinti be used for white wine and red wine? @Regina Dear Regina, Cleaning the VinoVinti is easy. Remove the ceramic rod from the holder by pulling the shorter end (also with out grooves) of the holder and sliding the rod out. Rinse both pieces under hot water and let air dry. Make sure the ceramic is completely dry before storing. You can use the same VinoVinti on both red and white wines. Red wines will tint the rod. This does not effect its use on white wines. Just rinse the rod between bottles. Do some people like the carbonic acid in the wine or is all wine thought to be better without it? Thanks for your question here. I've just asked Valerie to provide her thoughts on this as she will have the best answer. Sorry for the delay in response. @Amy Amy, People's taste in wine varies widely. Some wine drinkers like a lively acidity, but many more like their wine to be smoother with no overwhelming acid or tannins. We suggest that when you open a bottle of wine you taste it. If you think could be smoother and more balanced- use VinoVinti. VinoVinti is not intended for use with sparkling wines. When wine enthusiasts and long time friends Guy Beck and Nick Thompson began making their own wine, they never imagined it would inspire them to invent a device that could remove carbonic acid and improve the flavor, feel, and finish of any bottle of wine in a matter of seconds.